Highgate is surrounded by bike friendly streets and bike lanes for any bicyclist to enjoy. Take a break from behind-the-wheel and explore Tysons. Jones Branch and Westpark Drive are both bike friendly roads. Plus, there is a bike storage station located directly inside the Highgate Garage for easy access as well as a bike work station for convenient bike maintenance. Take a look at or download our local transportation map here to see area bike trails in relation to Metro stations, bus stops, nearby business and more. View the Farifax County Bike Map to see your numerous bike options throughout the region. here to see bus stop locations. Capital Bikeshare has launched in Tysons, VA. The area’s largest Bikeshare system provides you with over 3,500 bikes spanning 400+ stations across D.C., Arlington, Alexandria, Montgomery Co., Fairfax and Reston. You can rent bikes for a day or 3 days, a month, or a year. The first 30 minutes of each trip is completely free. 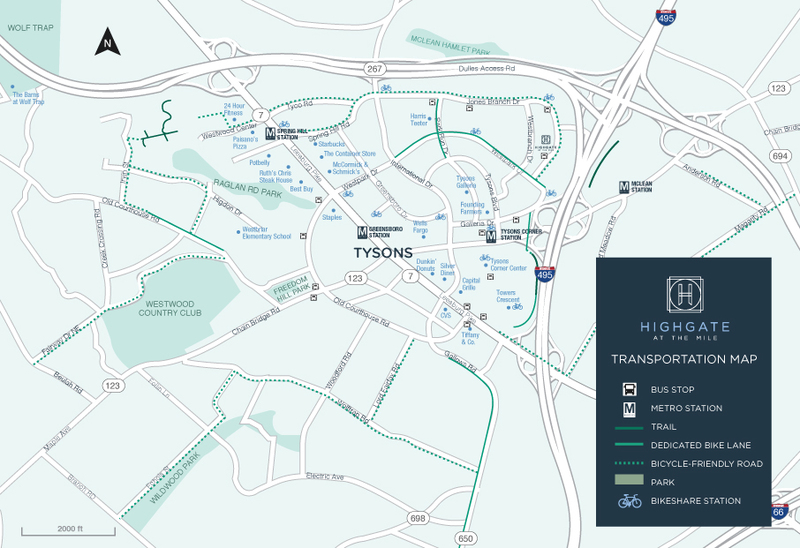 Of Tysons’s 14 stations, the closest to Highgate at the Mile is out front of the 7900 Westpark Dr building. For more information or to sign up for a Capital Bikeshare membership, visit https://www.capitalbikeshare.com/.